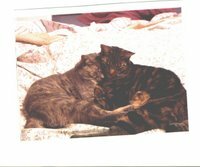 Karin Orsi's beloved cat, Otis (pictured on the right) has been missing for about a month now, from their home in Leicester, MA. I have communicated with Otis on several occasions, and Karin has also enlisted the assistance of several well-known Animal Communicators, in an effort to ascertain Otis's whereabouts, and whether he is still in his body. We believe that Otis is still in physical form, but have not been able to locate him, nor has he returned home, in spite of our repeated efforts to persuade him to do so, and to determine where he might be found. We have recently decided to ask for assistance from Otis's sister, Allie (pictured on the left), who was killed in a car accident in August, and from Dweezle, who was with Otis when he disappeared from Karin's yard. Allie let us know that Otis was not with her, but that she was watching him. Dweezle shed some light on the circumstances of Otis's disappearance, confirming some information that we had received in previous communications. Talking with the missing animal's siblings or friends is another potentially productive way of getting more information about the lost animal's circumstances and location. I had a tomcat; and one day he prompted me what a nickname he preferred. But he didn’t say something, no, I guessed of that by the expression of his nice face and ears that I knew so good, so good; it happened while I talked with him quietly without expecting a reply as he had a rest after meal. That was wonderful moment.